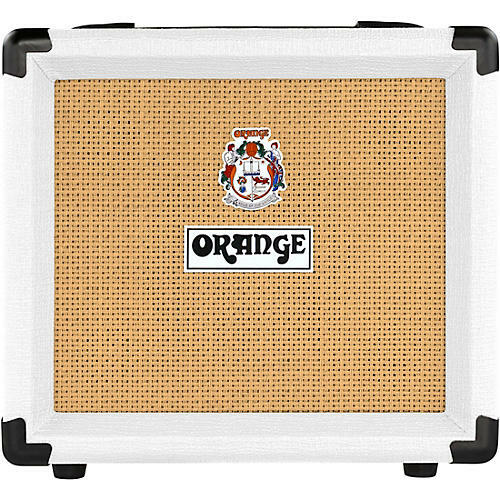 Get classic Orange, analog tone and style in a portable practice combo. The Orange Crush 12 is the smallest of the full-format Crush models designed for guitarists with a no-nonsense attitude to quality analog tone. This single-channel combo features a powerful, 3-band EQ and dedicated Overdrive control for tones ranging from crisp and clean through to vintage Orange crunch. The Crush 12’s custom 6″ Voice of the World speaker ensures the amp always remains punchy and articulate, despite its tiny dimensions. The CabSim-loaded headphone output means huge tones at whisper quiet volume, making this combo an ideal practice partner for players of all levels. Orange's commitment to analogue amplifier circuitry in a digital age ensures Crush amps possess the lively feel and responsiveness that the company is famous for, inspiring guitarists to play their instruments, not the technology. The Crush 12’s Overdrive control can be used to sculpt a wide range of dirty tones, from sweet and crunchy to rich and thick. The newly voiced EQ section allows for even greater control over your sound. The headphone/line output includes the CabSim feature, faithfully emulating the sound of a mic’d Orange 4x12″ cabinet loaded with its flagship Voice of the World speakers. Use headphones for silent practice or connect to a mixer/recording console to capture huge, authentic Orange tones in the studio. Orange's own custom designed speakers deliver the perfect balance between modern low end punch and vintage highs, maintaining clarity even when pushed. Finished in Orange's legendary livery dating back to 1968, the Crush range features the classic basket-weave vinyl, woven speaker grille cloth, signature "picture frame" edging and iconic hieroglyphs on the control panel. Dimensions: 12.01" x 11.42" x 6.88"